Hillary is corrupt because she gave three speeches to Goldman Sachs! And now, I hire someone that worked at Goldman Sachs for years! GOP suddenly doesn't care about BENGHAZI! anymore. Almost as if the whole thing was a political witch hunt. I guess at least some are trying. Is it just me or does the steady pattern of these Trump threads make it all meld together. If it wasn't for the page divider i'd swear i've just read the same page a bunch of times over. Last edited by wolfwood; December 12th, 2016 at 04:17 PM. Looks like Democrats are going to repeat their incompetent opposition from the Bush years. Team Trump just took legal action to keep the electoral college from voting against him. Carly Fiorina being considered for director of National Intelligence....please don't mind the irony of this assessment. Speaking of parody being dead, Rick "I'm going get rid of commerce, education, and... I can't remember the Third" Perry is likely going head energy*. That also means he's in charge of guarding and protecting the nuke warheads. * That was the third. OK, now he's just deliberately choosing the worst/most ironic possible choices. Along with how Turkey is apparently holding one of Trump's properties in the country hostage. Can't wait to see his angry tweet at them. To be fair (as painful as it is to say that) WWE's stock holders had a moment of stupidity themselves when they thought Vince actually sold the company to Trump. 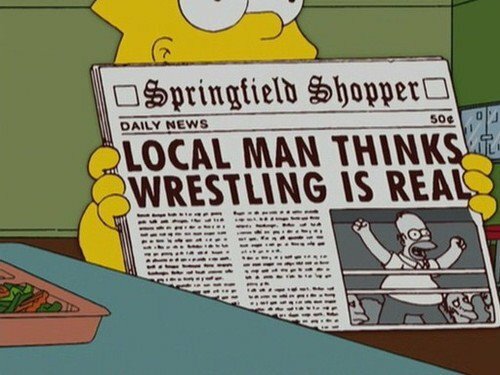 Is wrestling real? My that brings up memories ... like waaay back when Geraldo Rivera was on 20/20 (yes I am that old.. old enough to remember when he was actually a respected investigative reporter) and was covering wrestling. The wrestler he was interviewing took offence and slapped him on side of head while asking "Is that real?!" ... from what I remember it was reported that the move damaged Geraldo's hearing in that ear. One of the few times that there was a real move in wrestling. Trump doesn't put over people easily it's a give and give some more world to him. This is it. This is what is keeping me up at night. Not the idiocy, not the Russians, not even the racism. Ewww, Russia phobe over here! Look at all these Cold Warriors around here. Even the Senate Republicans, gross. Get with the times man. Kleptocratic faux populism is the next big thing, you can either hate it like a normal person, or lie to yourself about it like me! Your move bub. Reminder that even the actual politicians that Trump picked are corrupt and incompetent.